This British classic is easy to make and sure to be a hit with all the family. Preheat the oven to 180°C, gas mark 4. Wash the blackberries and remove any leaves and stalks. Peel, core and cut the apples into quarters, then halve again. Put in a large, ovenproof dish and mix with the lemon juice. Bake for 15–20 minutes. Meanwhile, make the topping. Place the rolled oats, flour, brown sugar and butter in a bowl and rub together until well mixed. 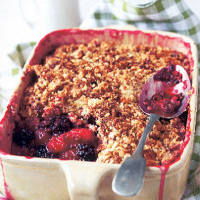 Gently mix the blackberries and the granulated sugar in with the apple. Cover with the topping and bake for 45 minutes until golden brown. Serve warm with crème fraîche, Greek yogurt, custard or vanilla ice cream.